are a very diverse goup of meteorites representing a wide range of developmental processes in the solar system. Some have crystallization ages rivalling those of chondrites, but they are generally younger than chondrites and represent metamorphically altered material. Most achondrites are "differentiated." They represent the crust or upper mantle of 'differentiated' bodies. Differentiation is the process that occurs in larger planet(oid)-sized bodies, in which the heavier elements, due to gravity, settle to the deep interior of the body. This leads to the formation of a core that is made primarily of iron and nickel, two of the more common heavy elements present in the solar system. What allows these elements to move? Leading theories at the moment suggest that there are three major ways in which these larger bodies became heated and melted enough for 'differentiation' to occur. The first is melting due to gravity; given a large enough body, the interior of it will melt due to heat and pressure. The second way a body can be heated enough to facilitate differentiation is via impacts; a lot of kinetic energy gets released when big bodies collide at high velocities, and it is usually released primarily in the form of heat. The third hypothesized means for melting a large body centers on the decay of radioactive elements. Back when the solar system was young, there were higher concentrations of shorter-lived radionuclei around. They were created in the supernova that led to the formation of our sun/solar system. Because so much time has passed, the radioactive isotiopes with shorter half-lives (that release more energy in less time, esp. in the form of heat) have mostly decayed away by now. Isotopes like Aluminum-26 no longer exist in any quantity in our solar system today. But it and other isotopes were likely responsible for much of the heating necessary to equilibrate chondrites and melt parent bodies enough to facilitate the fractionation of metals and silicates. Differentiated achondrites are particularly interesting because they represent crustal samples of large bodies that, in many cases, no longer exist, to our knowledge. Meteorites like Ibitira and Pasamonte *must* have come from large planetismals with basaltic crusts and iron cores. But since they don't agree chemically with what we know of the four existing inner planets, they must have come from large bodies that have been destroyed or removed from our solar system. The cut surface of a Eucrite -- a basaltic rock from the Asteroid 4 Vesta. 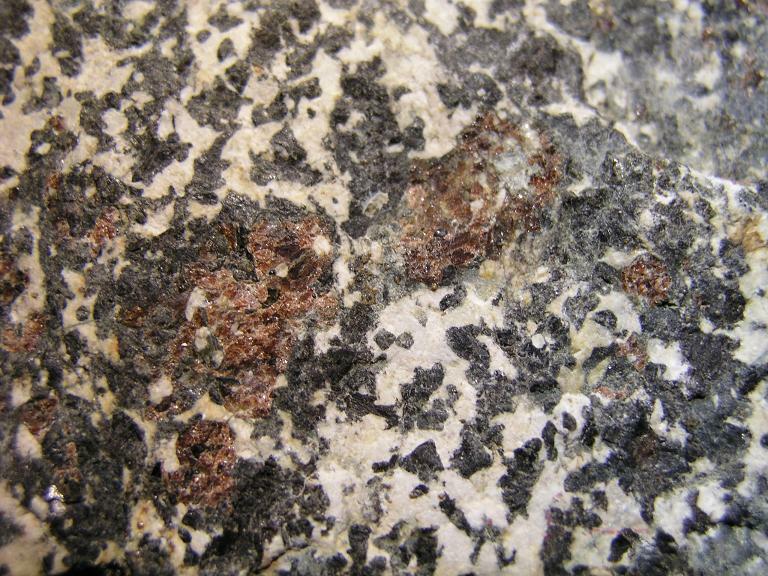 Compare to the following photo taken by Michael P. Kllmetz, of a terrestrial gabbro from Italy. They look similar because they formed under similar conditions - one in space and one on earth. Planetary meteorites (from the Moon and Mars) are also differentiated achondrites. Some have hypothesized that angrites come from the planet Mercury. This claim has not been proven, but is being supported by a number of prominent researchers. Others have refuted the claim, and debate is ongoing. Primitive achondrites consist of chondritic material that has been melted, but was not "differentiated." Many consider them to be 'melted chondrites,' because they are in many cases chemically and isotopically similar to existing chondrite groups. In other words, they're likely chondrites that have been melted and extensively recrystallized. Please see the links on the left for available achondrites.